When you test, or calibrate, a scale, you check its accuracy by comparing the known exact weight of an item to the weight displayed when it is placed on the scale. You can check your own scales at home too. While calibration weights serve this purpose, you can use other items of known weight. Commercial scales must undergo a regular schedule of inspection for compliance to standards for accuracy. Check the owner's manual of your scale, as there may be a prescribed procedure for calibration. You'll need a hard, level surface that doesn't shake. Load the scale evenly and allow time for your weight to settle before taking a reading. With a very sensitive scale, even the room temperature or atmospheric pressure can influence the reading. Digital scales will have a calibration mode, and mechanical scales will have a thumbscrew or similar adjustment. For simple accuracy testing of any size of scale, the general rule is to use a test weight similar to what you would typically weigh on that scale. You may need to combine a number of weights. Proper calibration calls for using a weight that's close to the highest capacity of the scale. Different commercial and international standards allow various amounts of tolerance between the test weight and the indicated weight. Lower quality scales are marked "Not legal for trade" because they fail to meet commercial standards. Food packaging shows weight as "NET WT," which indicates the weight of the product without the weight of the container. If the container is very light, as in the case of a candy bar wrapper, the gross weight is very close to the net weight. In a 2.260-kg (5-lb) bag of flour, the paper bag itself is about 23 grams. Add the net and the tare – the weight of the container itself – to get the gross. 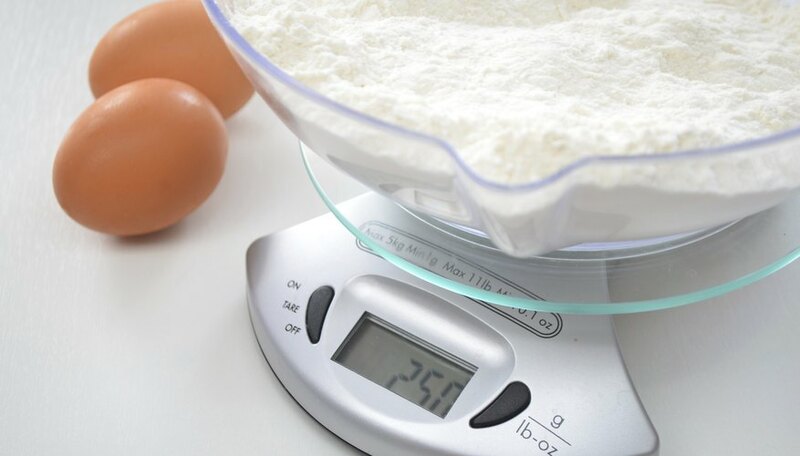 Weighing the bag of flour, your scale should read a gross weight close to 2.283 kg, possibly rounded up to 2.3 or rounded down to 2.28. Coins are minted to precise specifications, including weight, so they can serve as calibration weights. For example, a U.S. nickel weighs 5 grams. A penny weighs 2.5 grams. These numbers easily multiply, so 10 nickels can serve as a 50-gram calibration weight. Other U.S. coins are less useful because their weights don't fall at such even numbers; for example, a dime weighs 2.268 grams. A 1-euro coin weighs 7.5 grams, and a 0.02-euro coin weighs 3 grams. Silbajoris, Alex. "How to Calibrate a Scale Without Weights." Sciencing, https://sciencing.com/calibrate-scale-weights-4740563.html. 13 March 2018.